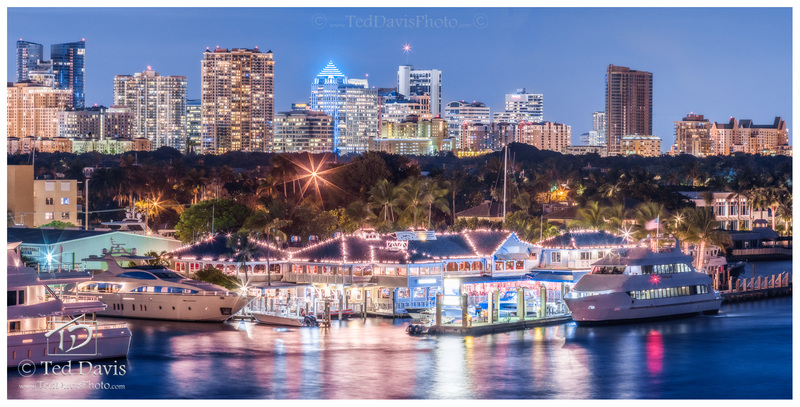 The iconic 15th St Fisheries in the Lauderdale Marina is quintessential Florida. Dinghies join massive Yachts along the quay as patrons flood the dining rooms for delicious fresh catch and high fashioned cocktails. As I gazed over the landmark, with the high-rises of downtown in the distance, I wanted to capture the glow of the skyline over the bright lights and beautiful colors from the restaurant. Mission Accomplished. Photo © copyright by Ted Davis.